Sizdah Bedar in Vesona Park, Los Gatos, California. April 6, 1997. It was my first Sizdah Bedar outting in God knows how many years. Seven, eight? The last one I remember was in the late 80s. I was with my pal Khosrow, his wife Yassaman, their kids and her family. We crammed into two Paykans and drove for an hour towards the east. We found a green spot in Jajrud, surrounded by short, narrow trees, where three or four famillies were sitting on the edges of their least valuable carpets, feasting on Sabzee Polo Mahi. A few months later, I left Tehran for the States. For good. After living in New Mexico and New York, with very modest Noruz gatherings with family and friends, I was anxious to see a large Iranian crowd in my new home in northern California's Bay Area. 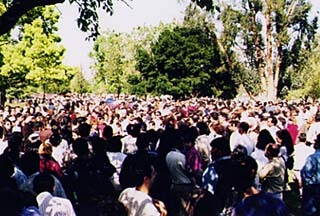 I had been told that I would be seeing thousands of Iranians in Vesona Park in Los Gatos. But I still couldn't believe my eyes. The only word I could think of to describe this Sizdah Bedar was "Qiyaamat".